Slurrykat's unique design of trailing shoe was designed with our extensive knowledge of slurry spreading in our contracts division over the past decade. The trailing shoe is designed mainly for use on grassland and arable land for applying slurry to the soil surface with minimum contamination to the plant leaves. It is made up of a single beam frame carrying steering shoe elements which are fixed at 215mm (8.5") spacings. Each element has a steering of -15/+15deg, which allows constant application of the slurry while turning around curves. The elements are fitted with a self sharpening share which parts the plant leaves allowing slurry to be delivered to the soil surface via a rubber injection cone, which is positioned directly behind the share. 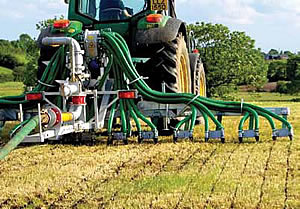 This achieves a uniform line of slurry on the soil surface, which reduces nitrogen losses by up to 80% compared with the original splash plate method. Odour from the slurry is also significantly reduced, with the reduction in contamination of the plant leaves, the trailing shoe system can be incorporated into rotational grazing system, whereby slurry can be applied after each grazing without affecting future grazing performance. The Slurrykat trailing shoe can be used as part of an umbilical system or tanker mounted. The Slurrykat shoe can also be fitted with a splash plate for flexibility of use. As with all Slurrykat spreading equipment a Flowmeter system can be incorporated. This means that precise application rates can be achieved and monitored and best use of the slurry can be accurately achieved..